This week, KSB joins organizations across the world as we celebrate World Breastfeeding Week. Our incredible team of Lactation Consultants are so passionate about the benefits of breastfeeding and work closely with all our new moms to help guide and support them through their breastfeeding journey. 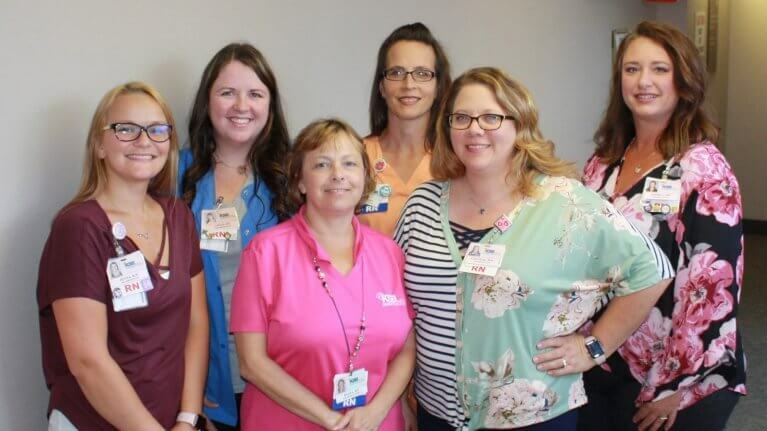 We sat down with our KSB Lactation team as they shared what they love best about their jobs and the benefits KSB offers as a Baby-Friendly certified healthcare facility. The Baby-Friendly Hospital Initiative is a global program that was launched by the World Health Organization (WHO) and the United Nations Children’s Fund (UNICEF) in 1991 to encourage and recognize hospitals and birthing centers that offer an optimal level of care for infant feeding, as well as mother and baby bonding. It recognizes and awards birthing facilities who successfully implement the Ten Steps of Successful Breastfeeding. In March, KSB was awarded our Baby-Friendly designation after successfully completing the four-phase comprehensive journey. Our staff is skillfully trained in giving moms the information, confidence, and abilities to successfully initiate and continue breastfeeding. From prenatal consultations to post-partum home visits, our certified lactation consultants help give moms and babies the best start possible! How did you get started in lactation services? I got started in lactation before I had my first baby. I was a newer nurse at the time and wanted to learn how to help my patients that were struggling with breastfeeding. The role of being a lactation consultant is something I hold very dear to me and am very passionate about. Both of my children were born prematurely, which brought some challenges with breastfeeding. With the amazing support from Board Certified Lactation Consultants (IBCLC), I successfully breastfeed my first until he was twenty months old and my second until she was two years old. My breastfeeding journey was much more successful because of evidenced-based information the IBCLC’s provided and their overall support. I started helping other moms navigate their own breastfeeding journey, and I now have a passion for educating moms on the benefits of breastfeeding. What do you love about the lactation services provided at KSB? The Lactation Program at KSB is led by a group of amazing nurses who are very dedicated to helping our patients succeed. They go above and beyond to do what is needed for our new moms and babies. I love that there is a lactation specialist available each day from 7 am to 7 pm to offer support to breastfeeding mothers. What is your goal in helping new moms as they begin their breastfeeding journey? I strive to help and assist every mother in a simple, easy to understand way. I try to offer support and encouragement, realizing that each mother and child is unique in their challenges, and help them to develop a plan to meet her goals. My goal is to meet each mom and baby where they are at and help provide a positive breastfeeding experience. Every mother has a different goal for breastfeeding and I strive to help her be able to meet her goals. What sets KSB’s lactation services apart from other area hospitals? KSB has a very comprehensive lactation program. We offer Prenatal Consults, Inpatient Consults, and even a home visit by a Board Certified Lactation Consultant after discharge. In addition, if a mother needs additional help, we offer postpartum consultations any time after she delivers. Our team has extensive experience and does a wonderful job of empowering and educating women. We offer a wide range of services and collaborate with her entire healthcare team to create the best plan for our nursing moms and babies.